2008 and 2009 are no stranger to co-op survival modes. "Waves of enemies"..."team up to survive"...these phrases are quickly becoming mainstream. 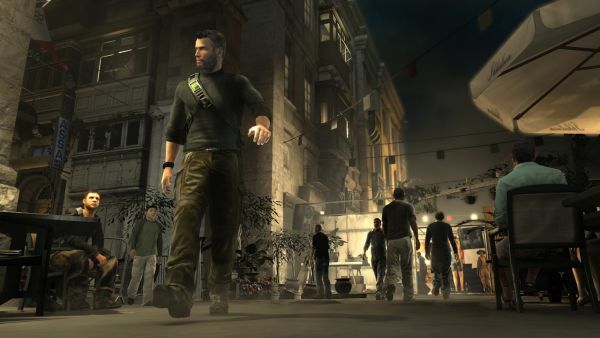 Now, Splinter Cell: Conviction joins the lineup. When we brought you news of a co-op campaign, we half expected Ubisoft to leave it at that and move onto multiplayer. Little did we know that the multiplayer component would include Deniable Ops, a four-player co-op challenge mode with four types...including co-op survival! and Face Off, wherein players go head-to-head alongside teams of customizable AI characters. The best part about Deniable Ops is the player count: four players online. It's also being reported that the "Tom Clancy standard of XP" is being implemented, meaning that guns, gadgets, and appearance can be upgraded using experience points that you accumulate throughout all modes. This type of persistent customization is a large part of what made Rainbow Six: Vegas 2 such an enjoyable co-op title, and something that the two most recent Call of Duty games should have had. So far, there is no info regarding splitscreen play. We'll keep you updated as we find out more! Page created in 0.3835 seconds.